Double Dip, the second Davis Way mystery by Gretchen Archer, is due for publication in January 2014. This seems like an optimum time to review the Double Whammy again. I’ve had the honor to be one of the editors on the next book, so I can not longer be objective. It’s become person. But — if it weren’t wonderful, I wouldn’t have gotten involved. Double Whammy is good. Double Dip is great. Fast, funny, witty and complex, it continues the Davis Way story. I can’t review it yet. It’s too early, but I will tell you that I loved it. Really loved it. It’s delicious, a confection of a mystery. Gretchen Archer is an author who could go big. So check out Double Whammy and get ready for the next one. In the course of the second divorce from her first-and-second husband — she refers to him as her ex-ex — Davis and Eddie behaved badly. Badly enough to get her fired from the force by her father and for 2-way retraining orders to get slapped on Davis and her ex-ex. The juicy details of what happened are never given. I rather hope future books will flush out that piece of history. After a very long search for some kind of job, she is hired by a Biloxi casino, purportedly to discover how someone(s) is beating the machines to collect the jackpot on their Double Whammy Poker slot machines. The terms of her employment are murky. From the get-go, Davis is sure that there’s something seriously awry with the entire setup but she needs the job. She needs the paycheck. It’s hard to do your job when you aren’t sure what your job is. Harder still when nobody is who or what they appear, including Davis herself. Davis gets in deeper and deeper until she is about to be swallowed by the crime she is investigating. Eventually, with help from unexpected parties, she extracts herself from the quagmire that threatens to keep her in prison for a very long time. And she finds love. Her own double whammy. I liked it. The book is funny, fast-paced, witty and ironic. The biggest problems for me were occasional narrative leaps and missing transitions. I found myself backing up and rereading to make sure I hadn’t missed something. But that’s quibbling. A bit too much humor derives from Davis displaying a dopiness that’s out of character. She comes from a small town, but she’s no hick. She has degrees in Computer Science and Criminology. There’s not a dumb bone in her body. She has the makings of a strong female character and that’s rare enough in the world of mystery writing. The plot is complicated, but I like Davis Way. She’s observant, creative, dedicated and brave. She has a lot of heart. The book is uneven but Gretchen Archer has a fresh voice I’d like hear again. As a first novel, Double Whammy is ambitious and well-realized. She has created a strong main character and a story with plenty of action. She handles a complex plot, a whole bunch of characters, a love story and accompanying back stories and still manages to tie up the ends. That’s an amazing accomplishment for a new author. I’m convinced as Ms. Archer gains skill at her craft, her characters will grow and mature too. It’s a good book — fast-paced, lively and charming. It leaves plenty of room for character development and future stories. When there are more books in the series, I will read them. I’m expecting great things from Gretchen Archer. She has been compared to Janet Evanovich (Stephanie Plum). There are similarities in their writing styles, but that’s where the resemblance ends. Davis Way is potentially a very strong character. She isn’t just funny. She has depth. Computer expert and criminologist, she’s been brought up by a police chief father. She knows how to handle weapons and has the instincts of a real detective. I hope the author develops these qualities. Davis could be a terrific sleuth. 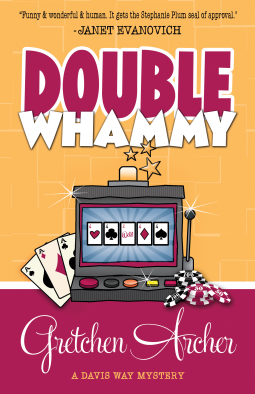 Double Whammy is available from Amazon in both paperback and Kindle. 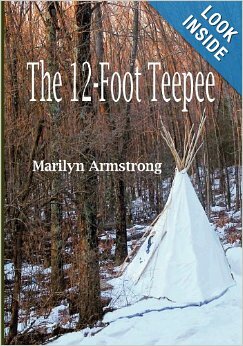 At a $2.99 introductory price on Kindle, it’s priced to sell. It’s more than worth the price. It is also available from Audible.com. Gretchen Archer is a Tennessee housewife who began writing when her daughters, seeking higher educations, ran off and left her. She lives on Lookout Mountain with her husband, son and a Yorkie named Bently. Double Whammy is her first Davis Way mystery and her first novel. But look for more, coming soon!! Good book … and her second one is much better. I think that’s coming out in February (maybe January).